Foreign Secretary Jack Straw has warned Britons intent on travelling to Saudi Arabia for the Muslim Hajj pilgrimage to be "vigilant" of terror attacks. Mr Straw said the UK thought further terrorist atrocities could occur, but told the 20,000 expected to attend to "make up their own minds". The Foreign Office had warned to only travel to the country if necessary. 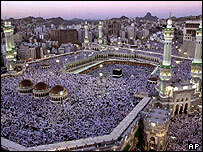 The five-day Hajj, which starts on 31 January, is one of the most important religious events for Muslims. It is the fifth and final pillar of Islam - a journey every adult Muslim must undertake at least once if possible. An estimated two million worshippers are expected at Mecca, where Muslims believe the prophet Ibrahim was told by Allah to build a shrine dedicated to him. The terror alert in Saudi Arabia was prompted by suicide bombings at residential compounds in the capital Riyadh last year, which killed 52 people in May and November. Mr Straw was speaking at the launch of the British Hajj delegation at the Islamic Cultural Centre in London's Regent's Park on Monday. He said: "Saudi Arabia, like many other countries in the world, has suffered some dreadful violence of terrorism over the last year, and our assessment is that terrorists are planning further attacks there. "It is important everyone makes up their own mind about travelling based on the advice and information which we make available. It is updated regularly on our website. "I would advise those pilgrims performing Hajj this year to remain vigilant, to take all necessary steps to protect their safety and make sure they have confidence in their individual security arrangements." Last week Saudi Arabia warned pilgrims not to undermine security during Hajj. British Airways cancelled its flights to Riyadh for several days over the New Year following warnings of a possible security threat.